Many people love displaying artistic birdhouses or attracting songbirds outside their home. 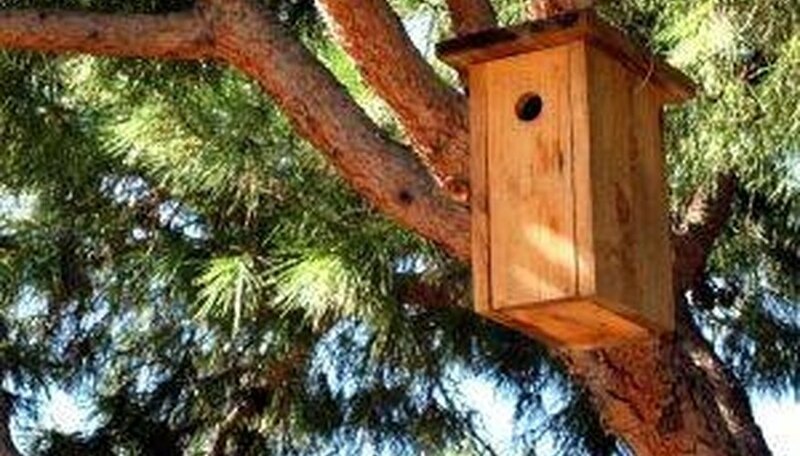 Instead of purchasing standard ones, consider making your own birdhouse to please your feathered friends. Cut three pieces of 1-by-6-inch wooden board 1 foot long and one piece of board 10 inches long. Also cut a 4-inch square and an 8-inch length of board. Measure down 2 inches on one side of a 12-inch board and draw a straight line from the top corner to this mark. Repeat this process for another 12-inch board. Cut along this diagonal line. Line up one of the diagonally cut pieces with the tallest board so the angle overlaps with the width of the tallest board. Use a pencil to trace the angle onto the tall board. Do this on both sides of the tallest board. Cut off this angle piece on both ends. Place one of the diagonally cut pieces longest side up and position the tallest piece of board on top of it. Nail at least three nails down the length of this juncture to make a strong corner angle. Repeat this process on the other side of the tallest board by nailing down the other diagonal piece. Measure 2 to 3 inches down the center of the 10-inch board and draw a dot. Choose a circular drill bit the size of the hole you want as an entrance to your birdhouse. This depends on the type of bird you hope to attract. Place the center of the drill bit on this mark and drill out the hole. Sand the edges if necessary. Repeat the angle-tracing procedure on the 10-inch piece for the other side of the birdhouse. Cut off the small triangular pieces and then nail this piece between the two diagonally cut pieces. This will form an open-ended box with two sloping sides. Push the 4-inch square into the flat base of the box and nail it in place. Screw one side of a large or two small hinges to the back of the tallest side of the birdhouse. Screw the other side of the hinge to the edge of the 8-inch board you cut previously. Be sure the hinge allows the board to open all of the way and close securely. If desired, paste a piece of shingle to the roof of the birdhouse. You may also like to paint or stain the birdhouse for a more stylish look.